Like I promised, I’m here with an English counterpart of the previous post written in my mother tongue, समुद्र, which means sea. Although, as I previously said, this post is still pretty different. If you guys remember (which is something that I doubt), I had written a post more than a couple of months ago that went by the name Queen. When I had written the post, I wasn’t sure whether it was going to be a standalone or whether it would evolve in a series in itself. But, as it turns out, I had a few things in mind which gradually blossomed into a narrative that blended well with the protagonist of the story. And so, here he comes again! BTW, one can also call this post as a ‘theme post’ of this blog, because it dives into the real reason as to why I named this blog as ‘The Pensieve’. Though it had surfaced so unexpectedly, he knew that it had been there all along, simply bidding it’s time. That goddamn bag of emotions. It was indeed a true cocktail. For it was a blend of almost every emotion the human brain could concoct. Affection coupled with hatred. Guilt and also regret of which there was absolutely no shortage. And of course, anger. Oh boy, yes. It lurked in the corners, never quite showing itself up, but it was there. Omnipresent. When would he be able to put it in the past? Or would it go on forever? “Hey?” a voice said,abruptly interrupting his musing. “Can I ask you something?” she said, while looking at him curiously. “I guess…” he answered, finding himself glad to have her distract him. “Why are you always so thoughtful?” she asked, with a frown on her face. He shot her a puzzled look, confused by the way she had suddenly dropped the question on him. He opened his mouth in order to respond, but the words failed to materialise. And hence, he chose to stare far ahead instead. “See? !” she challenged, her suspicions confirmed. “Why is that? And today, it seems even more so, with you simply looking at the ocean as though it has something immensely valuable to offer.” she said, watching him with concern. He let out a deep sigh as he caught a glimpse of her pained expression and decided to share a piece of his ideation with her. “You know why I like the ocean so much?” he asked. She frowned, trying to recollect. “No…” she replied, still thinking. “But I’d love to.” she added almost immediately, with a playful smile on her lips. “Honestly, I’ve had a special place for the sea ever since I was a little kid. Though I didn’t actually do it back then, I felt as though I could simply look at the ocean for hours at a time, losing myself in it’s rhythmic fluidity.” he began, the words flowing as though they had been on his mind since ages. “For it rises and falls, much like our emotions. Ever changing, never once holding steady. Our minds go through the highs and the lows. Like the tides which though at one point seem to swallow the shore whole, always relent for one to see the coast yet again. Moments passed as she simply looked at him, fascinated by his speech. Which was why it took her a while to realise that she had been asked a question. “I’m sorry?” she said, being none the wiser. Smiling, he decided to answer the question himself. “If you’ll sail a little away from the coast, you’ll know that things don’t really change there. Most of the times, the waves are slow and dull, almost as though lulling you into sleep. That’s the core of the human mind. Even though it seems to change a lot from the outside, in reality it doesn’t change that much. For the sea usually discards the unknown or the unwanted right on to the coast. Be it a storm or a piece of debris. And it’s successful. Almost always” he said, his words being the only sound made on the otherwise quiet shore. Except for the waves, of course. She waited expectantly, but apparently he had said all that he had wanted to. “So…” she said, after a while. “So?” he asked, looking at her inquisitively. “Has it given any?” she asked, while making herself comfortable on the sand. “Yeah. It’s an impossible one though.” he said, letting out a soft sigh. “A lake?” she asked, perplexed. “An isolated collection of water. A place where the water simply flows in and stays locked somewhere, unable to merge with the ocean.” he replied, explaining his analogy. “So if the ocean is a human mind, then the lake is…” she questioned, intrigued. “Well…. That’s the problem. There’s no actual lake here. And even the thing that comes the closest is purely fictional. It’s a Pensieve.” he said. “A what?” she asked, confused. “A Pensieve.” he responded, with a hint of a smile. Oh! So that was where she had heard it. She knew it sounded familiar. “But I think I’m gonna need a heads up over here!” she continued, while looking at him cheekily. Smiling, he cleared his throat and began reading in a business like voice from his phone. Before he could go much further though, she cut in. “Hey! Whoa!” she said, motioning him to stop with her hands. “Cut to the specifics, won’t ya?” she admonished him, upon which he jumped through a few paragraphs. “The Pensieve is enchanted to recreate memories so that they become re-liveable, taking in every detail stored in the subconscious and recreating it faithfully, so that either the owner, or a second party, is able to enter the memories and move around within them. Even more difficult than the recreation of memories is the use of a Pensieve to examine and sort thoughts and ideas, and very few wizards have the ability to do so.” he said, finshing reading it out. “Oh. That must be interesting.” she replied. “It sure is. And for a while, I thought that I had it all under control. For it seemed as though I had found out a valuable substitute.” he said. “And that substitute being?” she asked, eager to know the answer. “Solitude.” he simply replied, shrugging as he did so. “It offered me space and time to think, which was all that I needed to get going. But that’s not what I want to do anymore. For finding patterns and links in those memories seems like a vicious cycle I’d never get out of. Each time, I would come up with something new. Something, which was bound to be crushed sooner or later….” he continued, his voice full of a wistful sadness. “That was when I realized that that would not be why I would want a pensieve after all” he added as an afterthought. “Huh?” she asked, clueless yet again. “It’s a theory, but it’s said that once you put a real memory inside the Pensieve, it’s possible to forget everything related to it. Everything except the recollection of putting the memory inside the Pensieve.” he clarified, not having the need to read it out this time. There was a small pause as she processed what he was trying to say. 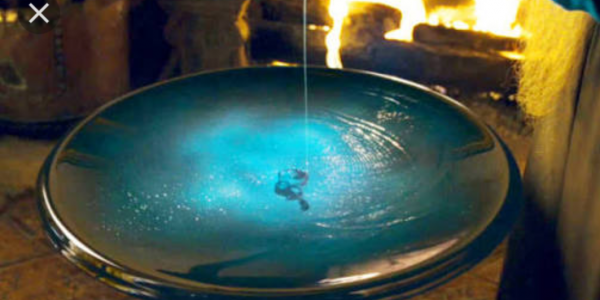 “So you want a pensieve in order to….” she said, her voice trailing uncertainly. “Forget. Yes.” he said, finishing the sentence for her. “Why?” she asked, not quite understanding. “Because, for me, hoping and remembering are two sides of the same coin. I simply cannot lose one without losing the other.” he revealed, his voice reflecting the profound emotions behind those words. Honestly, the reason why I named my blog as ‘The Pensieve’ is precisely that. Because it was a place for me to put in my thoughts and memories and make out links and patterns, to create something sensible out of the haphazard mess inside my mind palace. The only flaw in the plan has been voiced by the protagonist. I guess you’ll need to read the next part to know the answer! Hey there! You’ve been pretty deep here…And the way you created a story out of your thoughts, well, that is simply amazing! I knew that ‘Queen’ was supposed to have a part 2! And justice is served at last! Thank you so much for your compliments! 🙂 It’s readers like you who inspire me to write during those ‘bad days’….. And hence, I owe you too. And hey! You write exceptionally well even in your ‘bad days’. I do know that phrase…. And I’m going to be using it in my next update (Oops. Spoiler alert!) But truthfully speaking, I’ve grown tired of that phase. It’s been too long that I have been listening to it, making me lose trust in it. It’s true that there’s light at the end of every tunnel… But I firstly made the mistake of misjudging the length of the tunnel, and by now I have lost orientation of what ‘light’ actually is. Never mind😅 I’d better stop here. I tend to get carried away otherwise…. And thank you for saying that. I really appreciate your understanding and feedback. I do. It’s totally fine…I’m glad you’re getting over it . Wow!! I am totally in awe of the journey of the mind that your are taking us on, the intricate layers that you are building. And to be able to express so fully and skillfully in two languages is outstanding. I will be back for more. Anything this good is worth the wait. I have a question. I came across your blog bcz of its name and the pic. Are you, by Any chance, a Harry Potter fan?? Yeah I know its weird but still a potterhead always looks for one! Of course I am! I guess you really didn’t read this post… Or else you wouldn’t have asked😅. Read up both of my posts named Pensive and a post called Perception. It has Harry potter references.